Hi, You have reached 1,000,000 Baseball Cards' website. 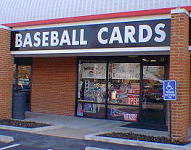 We are the largest and oldest card shop in St Louis. We have been in business since 1989 and have over 5,000 mail order customers so whether you are trying to finish sets or collect individual players you have come to the right site. On this site we have cards for sale from all four sports. To search for cards the first step is to click on the box in the lower right hand corner that says Online Store Beckett Marketplace Store. This will connect to a searchable database of all the cards we have for sale and has a shopping cart feature if you would like to order anything. It is also a secure site for placing an order with a credit card or paypal. If you want to order and pay by check or money order just cut and paste the cards in your shopping cart to a plain sheet of paper and mail it to us. Another way to search for cards would be to click on the Cards for Sale section. Here we have a listings of all of our stars, minor stars, stars, and high numbers listed by sport. No common cards are listed in this section and we do not update this section as often as the Beckett Marketplace store. Also this section is just for quick browsing. The shopping cart feature is not available in this section. Thanks and we hope we can help you soon.